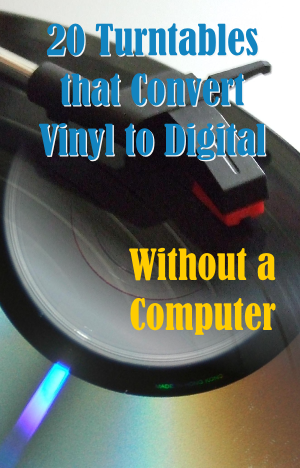 I frequently find reviews and comments from people that want an easy solution to transfer their vinyl records to a digital media. Many vinyl lovers don’t like messing with audio recording software. Some of the USB turntables I have reviewed like the Audio Technica AT-LP60 USB and the Jensen JTA-230 come with the audio recording software Audacity. Many users find this software difficult to use and the recording process time consuming. So, I thought it would be good to provide my readers with information about turntables that have the ability to record directly to a storage media, like a USB Flash Drive, CD, SD Card or mobile devices. Bear in mind that the sound quality you get from these turntables is not the best because most of them have a ceramic cartridge. So if you need to digitize your LPs with high fidelity, I suggest buying a better turntable with a magnetic cartridge and digitize your music using a good audio recording software. During my research I was looking for options to record vinyl records to a digital media. I grouped turntables under one of the following categories. I did not include turntables with USB port that need a computer for digitizing the music. At the end of this article you’ll find a comparison table with images of the products. I found other brands that sell outside the US. This is an all-in-one record player. 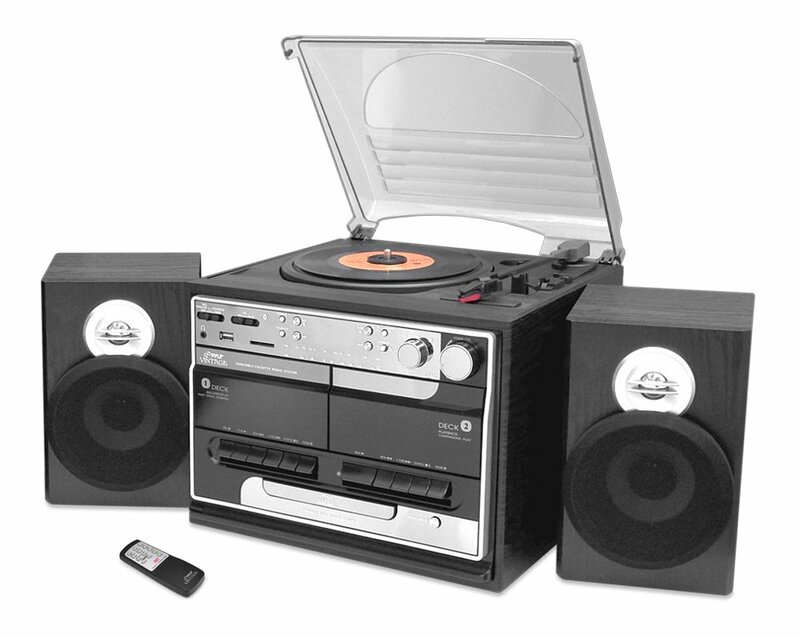 The LP-R550USB has a cassette player, AM/FM radio tuner, CD player and two stereo built in speakers. You can also connect this unit to your computer via a USB cable. It also comes with RCA outputs that let’s you connect it to other audio devices. With this turntable you can record your vinyl records directly to a CD. Plays 33⅓, 45 and 78 rpm records. Just like the LP-R550USB, this is also an all-in-one turntable. It has cassette player, AM/FM radio tuner, CD player and two stereo built in speakers. It also has a USB port for audio streaming. This one has bigger speakers and looks more professional but the features are the same. Supports 33⅓, 45 and 78 rpm playback speeds. This turntable can directly record vinyl records to CD without a computer. It can also playback CDs. It has 2 built in speakers on the sides. You have the option to connect to a computer via USB and it includes the EZ Vinyl/Tape Converter software for easy transfer. The LP 2 CD turntable lets you record your music directly to a CD. It has an internal flash drive that you can use for recording as well. Connection to a computer is possible through USB. This record player has counterweight, anti-skate and a standard headshell. All three speeds 33&frac13;, 45 and 78 rpm are supported. The Crosley Director is similar to the Memory Master. It has the same features except that this one cannot be connected to a computer because it does not have a USB port. You can record directly to a CD. It has 2 speakers, cassette player and FM/AM radio tuner. It supports all three playback speeds. This is a 3-speed record player with USB and SD/MMC Slots. It can directly encode from the turntable to a USB Flash Drive or SD/MMC Memory Card. No computer is needed. It has AM/FM radio receiver and two stereo built in speakers on the sides. It can play 33⅓, 45 and 78 rpm records. This turntable does not have USB audio streaming so you cannot connect it to your computer for recording. 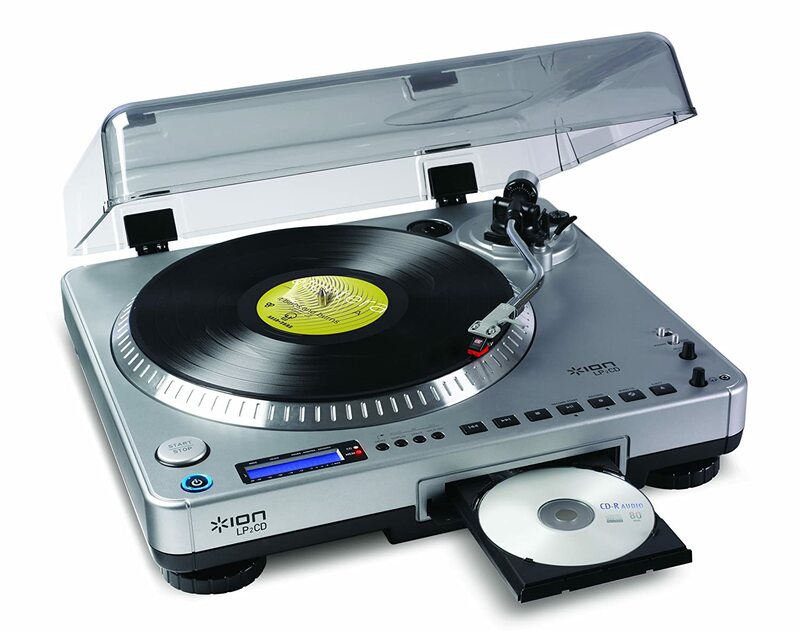 With this turntable you can encode your records to MP3 directly to a USB Flash Drive or SD Card. The unit comes with AM/FM radio tuner and two built in speakers on the sides. You also have the option to connect the turntable to a sound system for listening like any traditional record player. It supports 33&frac13;, 45 and 78 rpm speeds. With the Quick Play Flash record player you can record your analogue music collection directly to a USB flash drive. 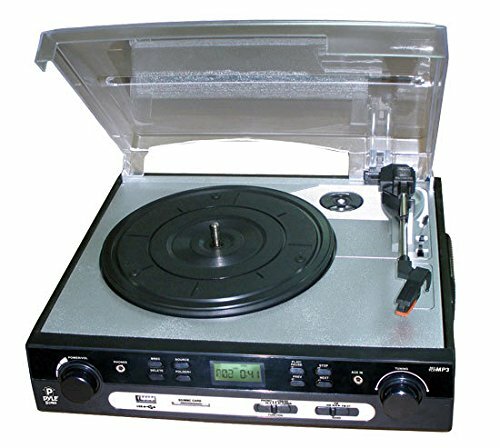 This lightweight and small turntable supports all three speeds and can be connected to a computer as it supports USB audio streaming. If you prefer you can connect it to a stereo system or a set of external speakers for casual listening. This unit allows you to transfer your records to MP3 format directly into a USB flash drive or a SD card. It has 2 built in speakers on the sides. 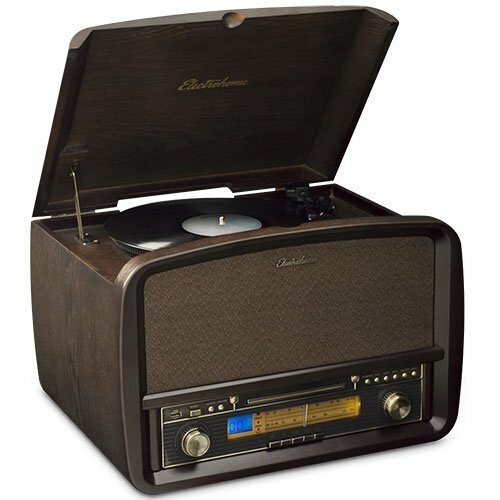 It comes with AM/FM radio and supports 33&frac13;, 45 and 78 rpm speeds. It cannot be connected to your computer for USB audio streaming. You can use this all-in-one player to record your vinyl records directly to a USB flash drive or a SD card. It comes with built-in speakers, CD player, cassette and AM/FM radio. It can play 33&frac13;, 45 and 78 rpm records. It does not support USB Audio Steaming. 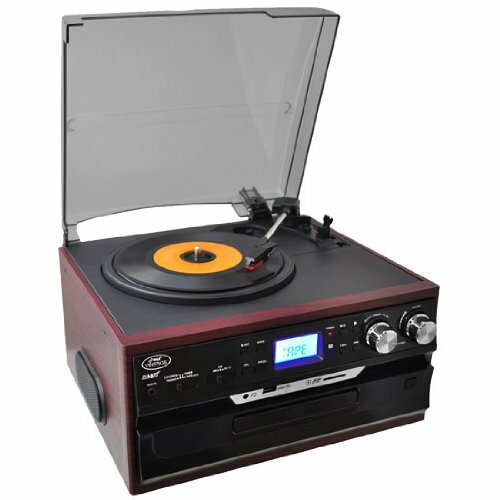 This retro looking record player makes it easy to record your vinyl albums directly to a USB flash drive in MP3 format but it doesn’t have a slot for SD Cards. It can play vinyl records, CDs, MP3 files and has an AM/FR radio tuner. This unit doesn’t record CDs and cannot be connected to a computer. This turntable can play 33&frac13;, 45 and 78 rpm records. This vintage style turntable allows you to record your analog music to a connected USB Flash Drive. It has 2 built in speakers and many features like CD player, cassette, radio tuner and a Bluetooth receiver. This unit does not record to CD and cannot be connected to a computer. It can play the three standard speeds. Record your vinyl records directly to a USB Flash Drive or SD Card. This turntable does not have a CD player. Other features include, cassette player and radio tuner. This is a self contained player with internal speakers. It supports all three playback speeds. These two products have the same features. Both can record directly to a USB Flash Drive or SD Card. They both have CD player, cassette deck and radio AM/FM. They are self contained units with 2 internal speakers. Both can play 33&frac13;, 45 and 78 rpm records. The only difference is the look. The PTCDS7UIW has a vintage look and the PTTCDS7U has a more modern style. This one has the same features as the Pyle PTCDS7U. Direct encoding to USB Flash Drive, CD player, cassette and radio AM/FM. But this model comes with two cassette decks so that you can copy from one tape to another. It also comes with two very nice external speakers. The record player supports the three standard playback speeds. This retro looking record player has a nice wood finish cabinet. 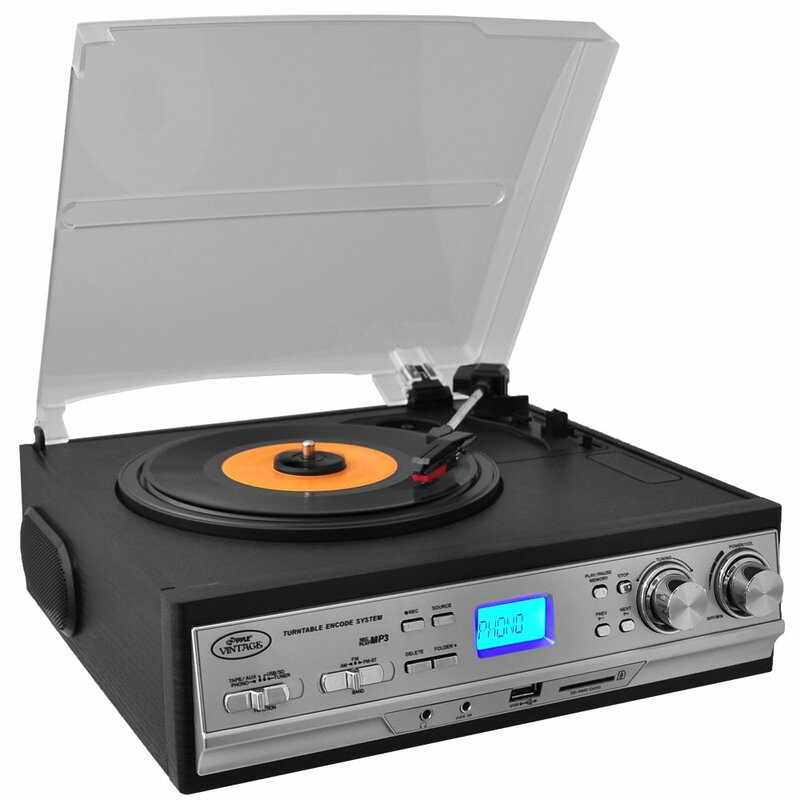 It plays vinyl records, CDs, AM/FM radio and MP3 filse through its USB port. It has two built-in stereo speakers that you can use to play other devices because it has a 3.5 mm jack auxiliary input. You can directly record your vinyl records to a USB flash drive without a computer. A headphone jack is provided for private listening. This product has very good ratings and Electrohome is a trusted brand. 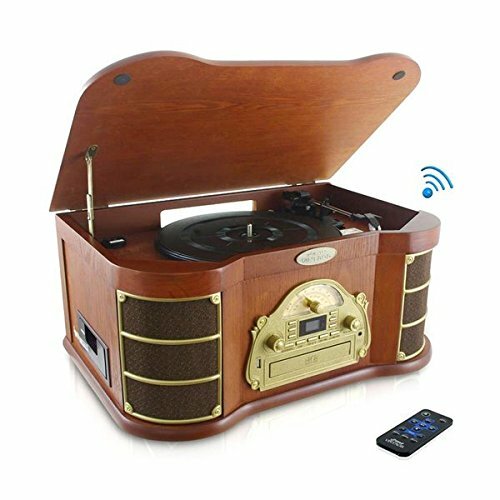 This record player supports 33&frac13;, 45 and 78 rpm rotation speeds. This unit is design to be used with apple iOS devices: iPod, iPad and iPhone. It has a docking station to plugin your iDevice. Download the EZ Vinyl & Tape Converter app for your iOS device. This application is very easy to use and lets you add your songs to your iTunes collection. This turntable supports 33&frac13;, 45 and 78 rpm speeds. It can also be connected to your computer if you decide to transfer the music to your computer. You would have to install EZ Vinyl & Tape Converter on your computer or other audio recording software for that purpose. Great option to directly record your LPs to your iOS device like iPod, iPad and iPhone. It has a very nice modern design. One of the advantages of this turntable is that it has counterweight, anti-skate and a standard headshell. You can connect this turntable to your computer using a USB cable or you can use it with external speakers like other traditional record players. The ION LP Dock can only play 33&frac13; and 45 rpm records. CD burner. A check on this column means that the record player has a CD burner for recording. It doesn’t include units that have a CD for playback only. SD Card. A check on this columns indicates that the unit has a SD Card slot for recording. It does not count products that have a SD Card slot for playback only. USB Flash Drive. This column refers to units that have an USB port for storage devices. A check indicates that the turntable can record directly into the USB storage device. This is not to be confused with USB port for audio streaming. USB Audio Codec. Units that support USB audio streaming can be connected to a computer for recording. In this case the USB port is not for Storage Devices, instead the sound is transmitted life from the player to the computer through the USB cable. iOS. 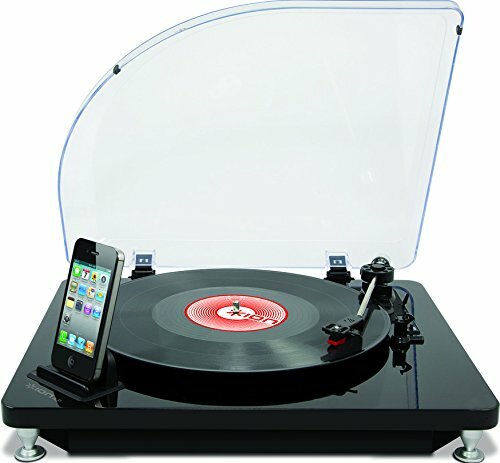 Some turntables have a special dock for apple devices like iPod, iPad or iPhone. In this case you can use an app to record directly to your iOS device. Some self-contained players with built in speakers have a 3.5 mm connector cable and dock for mobile devices, but this feature is only for playback, so I’m not showing them on the table. I have a Crosley CR66 5 in 1 and I desperately want to record onto a blank tape or dvd, but I can’t find a recorder. I am just unable to do so or am I missing something?? Sorry about that. 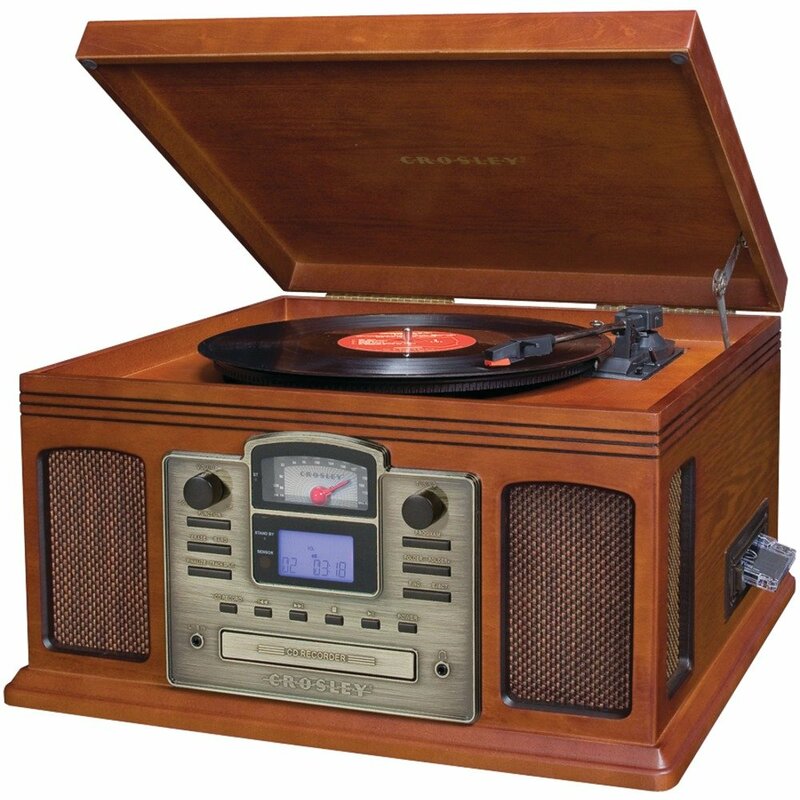 The Crosley Rochester doesn’t have a recording function. It only plays CD’s, tapes, radio and vynil records. The worse part is that this unit doesn’t have an audio output port either. So, there is no way you can use this turntable to record your vinyl recors. If your player is new, I would suggest to return it a get something form the list above. 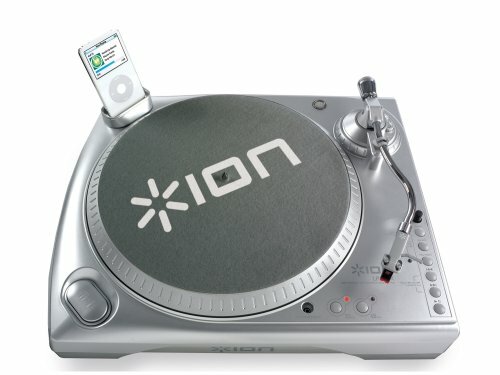 I have an Ion Turntable and just learned that iTunes will not allow music converted from vinyl on an Ion turntable to be saved to iTunes using Ion’s “E-Z” converter software. Are there any conversion turntables which are currently iTunes compatible? I still have a lot of vinyl that I want to convert. As far as I know, songs converted using Ion’s EZ converter software can be added to your iTunes library. Try it and if you have trouble, let me know, perhaps I can make a tutorial. Since it has been a few months since you responded to Robert Lee about a similar question, I thought I would give it a try with mine. What do you consider the best turntable that records directly to USB flashdrive or SD card? I don’t want to mess with a computer to record and fix up at this time. Just trying to get decent quality to plug and play off a computer or tablet later on. Most of the turntables listed on this article have more ore less the same sound quality. The difference in price depends on the additional features. The best player is the one that better meets your needs within your budget. If you just want to record your albums to a USB and don’t care that much about built-in speaker quality, look or other features, then I would get the Jensen 460 because it has the best price and it’s easy to use. My other recommendation would be the Electrohome Wellington EANOS502 because it looks better, it has better speakers and it’s a decent brand. I forgot to include it on the list. I’ll add this one, because I think is a good option. One thing to remember with these turntables is that they don’t automatically split the tracks. During recording of your album, you have to press stop and record again for each track you listen to. Otherwise, all the songs will be recorded on a single file. Another option you may consider is to buy a better quality turntable and connect it to an external USB recorder like the Pyle PAD6 Audio to USB recorder. Thank you for a rather comprehensive, fascinating bit on the numbers of turntables capable of recording to various modes from their original formats. I was wondering is you might have any particular favorite/favorites that fall within a $100-300.00 vs. >$300.00 range in pricing? I am sizing down in life and had long ago given away an incredible system my father and I had shared over the years (he was a Jazz musician back in the 1930’s/’40’s. But I had also long forgotten about his large collection of records dating way back to near the beginnings of…a garage fire was my final warning (back in 2009) and all of his 33’s perished in said fire. But somehow, the boxes of 78’s fell off their perch and were buried under the ashes as the fire burned at around 1800 degrees. Many include rare recordings from bands he played with or from radio broadcasts a friend of his made at CBS records in N.Y. So I would like to try to transfer/save them for the rest of the world/for the future. A few of them are original recordings-thus recorded inside out on the old “ce-ment records” 😉 So I need a player that won;t automatically shut down when I move the needle towards the middle of the record-to begin it…get it? I know, weird. But one is Frank Sinatra signing live from the studio in 1939-“Old Man River” and is worthy of being saved-even with the scratchy sounds, his voice still brings tears to my eyes. Anyway, I do have a box of my own rock records from the late ’50’s to play, so would like something decent. Frankly, the internet has about wiped out any need for much of anything anymore. But saving these rare gems would be quite nice and a decent player is probably necessary. Do you have any recommendations from your own, professional opinion? Thanks for your comment. That is an amazing story! Those 78 records are gems worth digitizing. I realized that the list didn’t have price information. I added approximate prices just for reference. I noticed that some products are unavailable at the moment, but they may be discontinued in the future. It’s amazing how fast products go out of market. Anyway, I understand you need a player to transfer your 78 rpm records, and you need one without automatic shut-off or that can be disabled. I personally would go with the AudioTechnica AT-LP120-USB. Because it plays 78s and you can install a special cartridge for playing 78 records. It won’t shut down because it’s completely manual. However, I don’t know if you are familiar with recording software, that can be a steep learning curve and the recording process really time consuming. But I’m assuming, since you were reading this post, that you prefer something that doesn’t involve transferring files to a computer. Is this right? If you don’t want to mess with software then the ION LP 2 CD is a good option for you. However, it’s expensive and looks like it’s no available for sale anymore (I’ll check on that). Then the problem you are going to face with the rest of the turntables in this list is that most have the automatic shut down feature and have a fixed ceramic cartridge. Although manufacturers say their turntables can play 78s with the same needle, you have to make sure to change the stylus to the appropriate one if you want to maximize sound quality. A very cheap option would be the Jensen JTA-460 which allows you to turn off the auto stop feature. 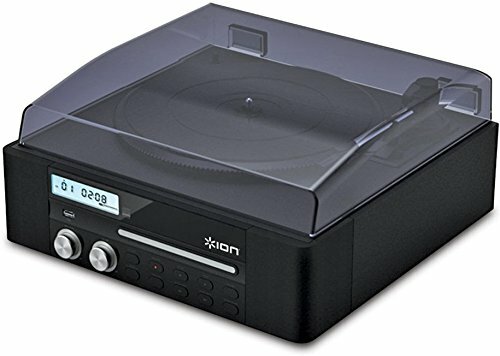 So, my professional opinion would be to buy the ION LP 2 CD if you can find it or digitize your 78 records with AT-LP120-USB using a computer and recording software. Just be aware that it’s going to take time and some learning. If you don’t care about the quality of the recording, and easy and cheap solution would be the JTA-460. I’ll keep looking for options for you. I’ll will also check which ones can disable the auto-stop feature.